Adalah – The Legal Center for Minority Rights in Israel provided legal representation for four of the 13 women detained by the Israeli military when it commandeered their Gaza-bound boat, dubbed “The Women’s Boat to Gaza”, who were slated for deportation from the country. 07/10/2016 Adalah: Detention of women was illegal as they were forced by military to enter Israeli territory, therefore not ‘illegally staying’ in country. 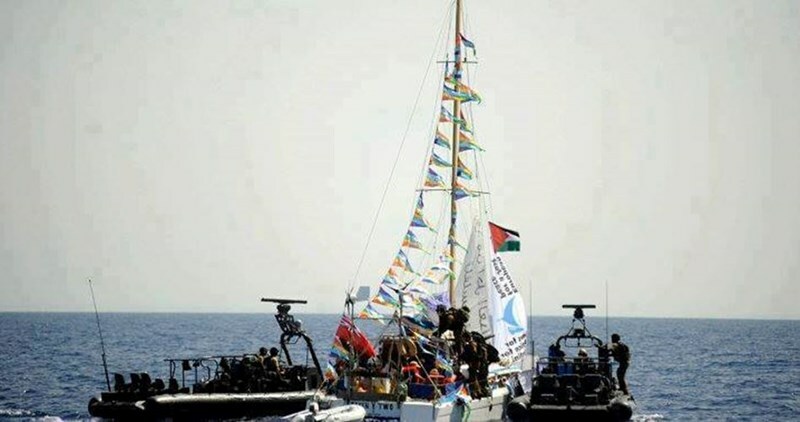 The Israeli navy took control of the Women’s Boat to Gaza, also known as the Zaytouna-Oliva, and its female crew on the night of 5 October 2016 as they attempted to breach the Israeli naval blockade of the Gaza Strip to call world attention to the grave humanitarian and human rights situation there. The vessel was stopped in the Mediterranean Sea approximately 35 nautical miles off the coast of Gaza and Israeli military forces brought its crew and passengers to the Givon detention center in Ramle. All four women were issued with custody and expulsion orders and agreed to sign a “request” to be sent back to their countries of origin as soon as possible. The Israeli navy commandeered the vessel when it was 35 miles off the Gaza coast. According to the 2009 order issued by the Israeli Defense Ministry, which Adalah also opposes, the military blockade of the coastal territory extends 20 miles out to sea. The Detention Review Tribunal ruled that the four women would remain in custody until their deportation from Israel. “The claims raised by the detainees’ representatives have significant importance, but the veracity of most of these claims should be determined at a later date… I refer now to the claim that the detainees were brought into Israeli territory against their will and may therefore not be considered ‘illegally staying’ [in Israel]. It is possible that the claim made by the detainees’ representatives is indeed correct: someone brought against his will into Israeli territory – by state authorities themselves – would not be considered ‘illegally staying’ in the country. Nevertheless, Interior Ministry authorities have decided to issue a deportation order against the detainees,” the Detention Review Tribunal wrote in its decision. As of the evening hours yesterday, all the women had been transferred to Israel’s Ben-Gurion Airport to await outbound flights to their countries of origin. Representatives of a number of Tel Aviv-based foreign consulates were also in attendance at the hearing. 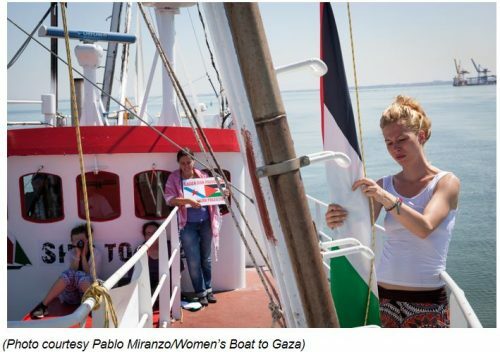 The Women’s Boat to Gaza is part of the wider Freedom Flotilla Coalition, intended to “raise awareness about the ongoing struggle that women in Gaza, in the West Bank, inside the Green Line and in the diaspora, have waged and continue to wage against the Occupation,” according to the organization’s website. 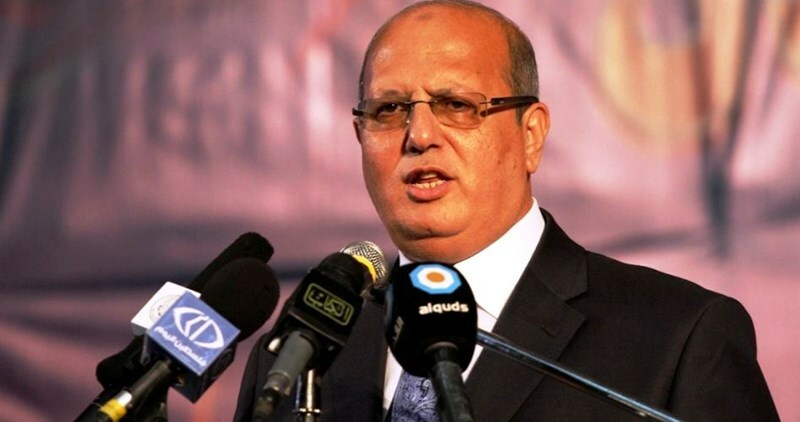 MP Jamal al-Khudari, head of the Popular Committee against the Siege, has said that the Women’s Boats to Gaza has brought to the fore Israel’s unjust blockade on the Gaza Strip and the Palestinian people’s need for a seaport connecting them with the world. In a press release on Friday, MP Khudari expressed his belief that the Zaytouna-Oliva boat reactivated the international solidarity with the issue of the blockade after it had been neglected for some time. He hailed the courage and stamina of the female activists aboard the boat and their belief in the Palestinian people’s right to live in dignity and freedom. Israel has begun deporting the all-female crew of sailors who attempted to break the siege on Gaza. The first two women returned to London on Thursday afternoon, a day after Israeli commandos hijacked the Women’s Boat to Gaza, an activist ship skimming towards the Strip’s maritime borders. Mina Harbalou and Huda Rahmeh, both journalists with al-Jazeera, arrived at Heathrow airport, and were greeted with bouquets of flowers. The remaining 11 passengers and captain of the Zaytouna-Olivia are still in Israeli custody, according to an organizer with Women’s Boat to Gaza, Wendy Goldsmith who spoke from Canada. The whereabouts of these women is not clear, Goldsmith said. “Our understanding is that they have been moved from prison to various detention holding facilities in the airport, where they will then be deported,” Goldsmith said. “They don’t actually receive their passports back until they are on the plane. We don’t have any information that they are on the plane heading home.” “The information I have is that they were apprehended by two Israeli warships and there were another four or five boats around those. And the Zaytouna was boarded by men and women,” she said. She asserted that the term “peaceful” which has been used in some media to describe the capture is incorrect. According to Goldsmith, peace is more than merely the absence of physical violence. Oppression, occupation, denial of human rights and taking a boat filled with nonviolent women against their will are not peaceful activities. The detained passengers have weighed-in in the form of pre-recorded messages prepped for release, in the event of Israel putting an end to their sea journey to Gaza. Notable sailors include Mairead Maguire, the Nobel laureate from Northern Ireland, former U.S. army colonel Ann Wright, and Marama Davidson, a parliamentarian from New Zealand’s Green Party. The Zaytouna-Olivia departed from Barcelona in late September, on course to arrive in Gaza this week. Organizers state the purpose of the month-long trip was generating attention for Israel’s one-decade-long blockade of the Gaza Strip.